How lovely to be on holiday in the UK again. It has been a few years since we had a summer holiday here and how lucky we are to have such splendid weather. We spent our first day in Bury St. Edmunds, a lovely historic town in which the St. Michael and Mary leylines cross. We arrived early in the morning as we had travelled by night ferry from Hoek van Holland to Harwich. As an angel person I thought it was great fun to park the car on Angel Hill car park. We were staying in the Angel hotel, how cool is that? 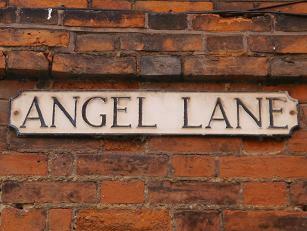 And our room overlooked Angel Lane. Around the corner was a little shop to buy cards and newspapers called Angel News. It certainly made me grin form ear to ear. We started the day by visiting the Abbey gardens wit hits beautiful roses wafting their wonderful fragnance in the air. 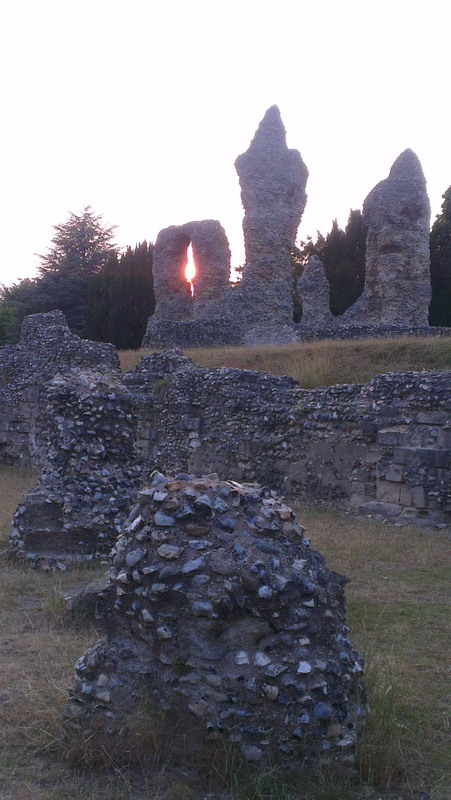 The ruins of the Abbey held a special appeal and I found an angel feather during our walk there. 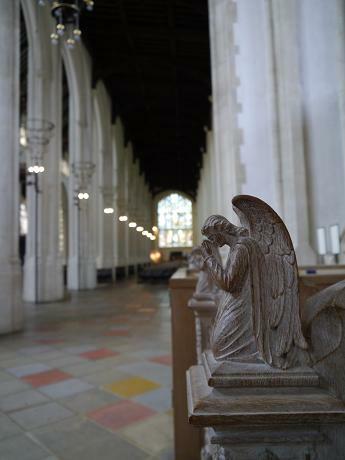 We then visited the church of St. Edmunds, where I photographed a beautifully carved wooden angel. St Mary’s church was next. You could have a competition to see who can spot the most angels. 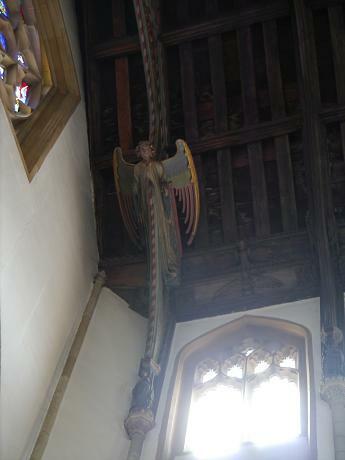 The nave has a magnificent hammer-beam roof. Eleven pairs of angels (a great angel number), attended by lesser angels on the wall plates form a procession of worship. Not to mention all the different angels portrayed on the stain glass windows. On the windows behind the altar you find the four great Archangels: Michael, Raphael, Gabriel and Uriel. I loved it! At night, after a lovely diner, we went in search of the energy of the leylines. I have always found it easier to tune into these energies when the surroundings are more quiet and peaceful. I was not disappointed! The leylines of Michael & Mary form a near straight line from St. Michaels Mount in Cornwall to Bury. On the line are wonderful sacred sites, such as the well known Glastonbury Tor and Avebury. Other interesting sacred sites are The Hurlers and Brentor to name a few. And it lands in the Netherlands where the Michael line can be felt at the Mary Chapel in Keins, Schagen. Many churches built on the lines have been dedicated to Michael and Maria. In Bury St Edmunds the Mary Line moves through Abbeygate St & Abbeygate. The Michael Line runs through Churchgate Street, and then moves through the Norman Arch to finally intersect with the M ary Line at the crypt of the abbey. We took a walk to the Norman Arch and from there walked towards the abbey ruins. I felt naturally drawn to a certain section of it, which turned out to be the crypt I had been looking for. I sat down to meditate and connect to the energies of the ley lines. Soon personal information regarding my spiritual path came in. I felt a joilt of energy move up my leg and was asked to send this energy to those in need. Light work and can be that easy…grounding well, opening your heart with a pure intention to receive for the good of self and all and then simply open up, after which you share the beautiful energies you receive with others. You can try it yourself! PS. You also feel a connection with Archangel Michael and / or Mother Mary? You can support your light work with them by using the Crystal Angel Essences Michael and Mary. Feel free to email me to order them by sending an email to info@angellightheart.com. This entry was posted in Angel Blog Article, Angel signs, Light work, Sacred places and tagged angel signs, Bury, Bury St Edmunds, Edmunds, Glastonbury Tor, ley lines, Mary, Michael, Michael - Mary, sacred sites, united kingdom on July 14, 2013 by Angel Light Heart.